Doing the happy dance! 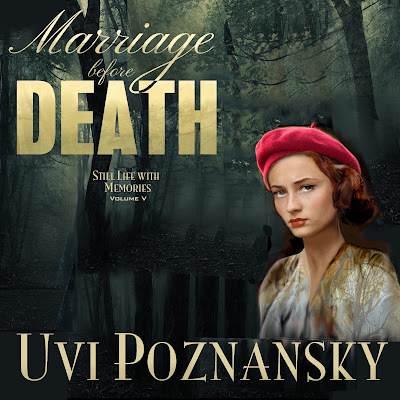 The audiobook edition of my WWII spy thriller Marriage before Death, narrated by Don Warrick, has just been released! This is volume V of my series, Still Life with Memories, but like the previous volumes it can be read as a standalone novel. In designing the cover I was inspired by Lenny’s impression of the girl with the red beret: “a slender girl whose hair was covered. It was tucked into a red beret, which was tilted, a bit whimsically, over her head.” Because this cover depicts a later scene in the story, some of her hair has slinked out of her beret. In the background is a dark forest, into which she has parachuted shortly before D-Day. A faint, subtle texture of branches appears also inside the word Death in the title. The forest is where she meets with bands of French Resistance Fighters, and where she promises to “make the sky rain weapons” for them. Her smack set me back on my heels. My sweetheart had always kept her emotions in check. She never shouted, let alone raised her hand on anyone. This was not only vulgar, it was far beneath her! Even for a diva, this was much too theatrical! Why was she behaving with such blatant lack of restraint? I got the answer at once and hoped no one else did. Quicker than anyone could take note, she placed something, a little soft thing into my hand. My fingers clasped it of their own, before I realized what she was doing. The next second—to distract the others—she threw the glass she was holding, threw it at my feet with a dramatic, spectacular flair. There was an awful noise as it hit the floor and broke to pieces, shards pinging against the floor. Without uttering a sound I gave her a look, begging her to leave. Rochelle—no, Natasha—gave one to me, begging me to play along. At that, the SS officer burst out laughing. It lasted quite a while, or so it seemed to me, and by the time it finally ended, a cruel smile was left across his face, stretching from one pointy ear to the other. Rochelle hung her eyes on me one more time. The SS officer cut in. At that I had a change of heart. Why? First, because I was moved to tears by her plea, no matter if it was a fake one or not; and second, because what had I got to lose? A triumphant smile played on her red lips. Yet, for just a moment, she was silent. I thought she might make peace with me, now that I relented. Instead, she turned to the SS officer. In surprise, “You’re not?” he asked, raising a thick eyebrow. My face was still burning, still stinging from that slap of hers. I bit my lips to overcome the pain. If I could muster the nerve to speak up once more, I would ask her the very same thing. The toothbrush mustache under Herr Müller’s nose started to twitch. Perhaps he was becoming suspicious of her. To listen to this excerpt--used for the five-minute voice clip--click the image and click the Play icon. THE GRAVES AT MERSA MATRUH.